The modern Kalam Cosmological Argument (KCA) for God’s existence involves literally hundreds of supporting arguments, counter arguments, and counter-counter arguments from a wide range of disciplines – philosophy of science, philosophy of religion, philosophy of logic, philosophy of mathematics, philosophy of time, philosophical theology, metaphysics, physical cosmology and cosmogony, and more. The body of literature relating to the KCA has grown to a significant bulk, and there is now a real danger of fragmentation, duplication, and misassessment because of the plurality of interpretations that the argument has received. One major aim of this book is to perform the scholarly service of laying bare the logical structure of the KCA… which, it is hoped, will make the work useful to future researchers… [And] another service performed by this book is to provide a report on the “state of the question” in contemporary analytic philosophy and thereby furnish a convenient guide to the significant literature on the KCA. My goals with this (very long) post series on the KCA are similar. But I have the advantage of unlimited space. Given enough time, I can summarize and clarify every argument relevant to the KCA. I can add new updates as new arguments are published. I can take time to explain complex articles in plain talk, so that the educated layman can keep up if she so desires. What is perhaps even more beneficial is that I can draw a massive, pannable, zoomable graphic map of all these arguments. My hope is that this will make it clear which threads of argument lead to dead ends, which threads require more research, which threads provide strong support for the KCA, and which threads greatly weaken the KCA. The map will also visualize the argument, which should clarify its structure in general. No such gigantic argument map could fit on the pages of academic journals and books, which is perhaps why philosophers have mostly neglected to use argument maps despite their power to clarify and illuminate complex philosophical debates. But this is the 21st century. We can do better. We need not be bound by Gutenberg’s limitations. 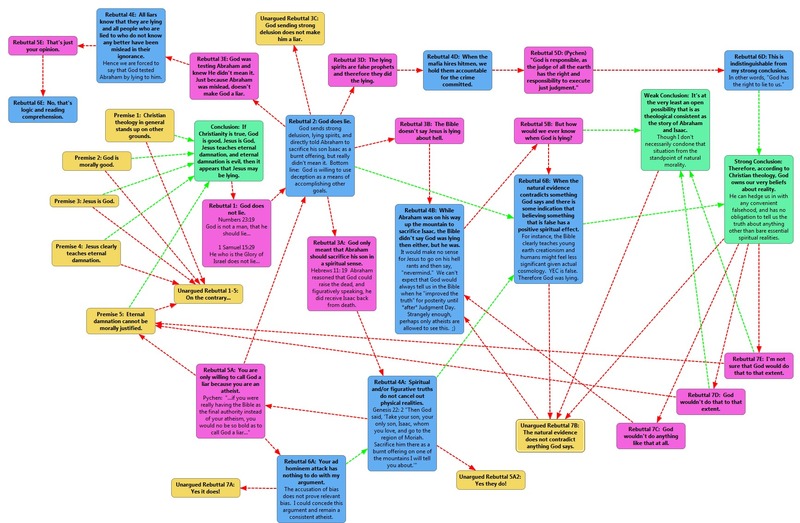 An open-source argument mapping program that allows for online collaboration. I couldn’t get it to run, so I don’t know how it works or if it’s any good. 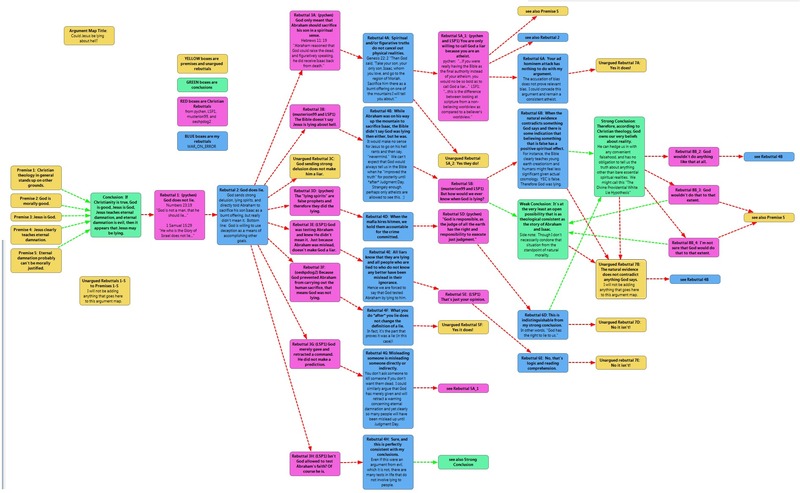 You can pan and zoom an example argument map about moral particularism here. Extremely basic argument diagramming that uses schemes, for example “argument from causal law” and “argument from division.” Very basic, not pretty. Example here. Looks decent to me, but of course very basic. Example here. The obvious choice. Definitely the best argument mapping software available. You can try out a 7-day free trial. Uses the Microsoft Office 2007 interface. Very slick. Example here. The leading diagramming program. Though not made specifically for argument mapping, it can of course be used for this purpose. 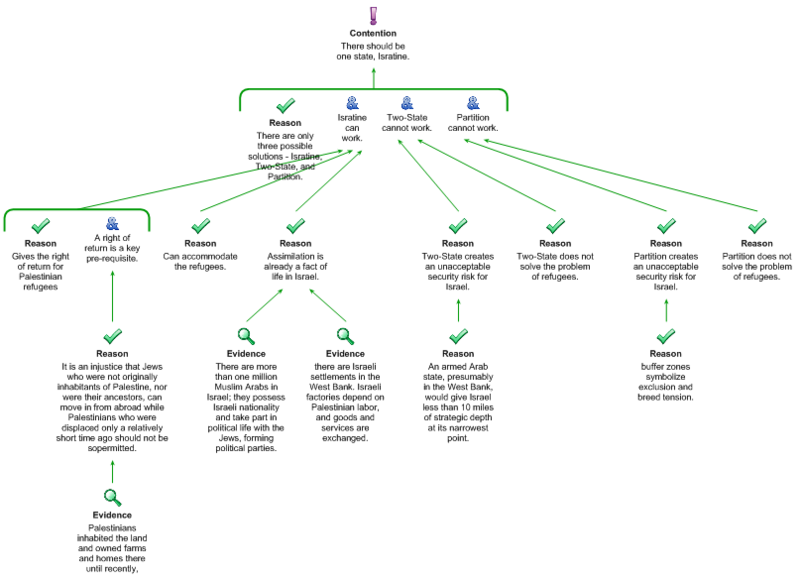 The Visio-clone for the KOffice suite. Generic diagramming software that could be used for argument mapping. An advanced Visio clone for UML mapping. A generic graphic diagramming software. When considering software made specifically for argument mapping, Rationale is the obvious winner, and Argunet is perhaps the most promising free choice. Among generic diagramming software that can be used for argument mapping, Visio is the clear leader, though Dia is also strong. Visio is more flexible than Rationale, but even Visio cannot export very large drawings to common image formats like PNG and JPG. 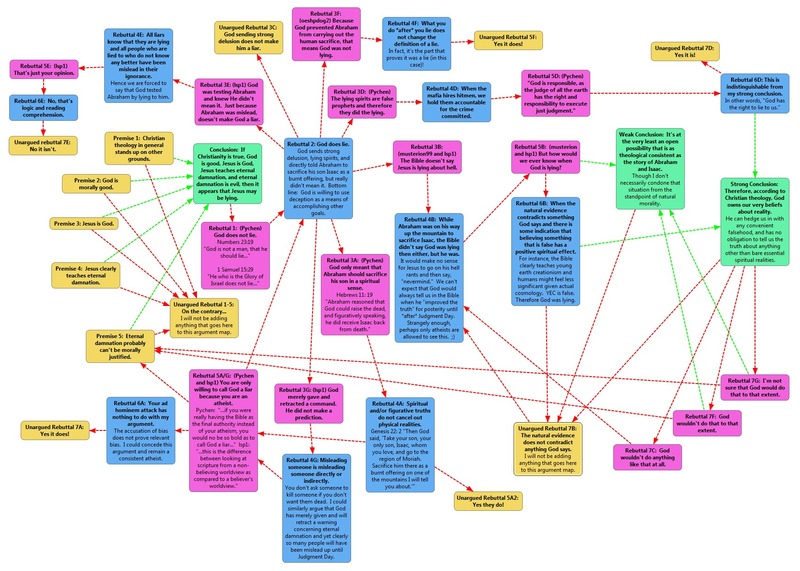 So, though it was not made for argument mapping at all, I am forced to use Photoshop to draw my argument map. It’s a slow and clunky way to draw an argument map because everything must be done manually, but at least the map will be pretty. 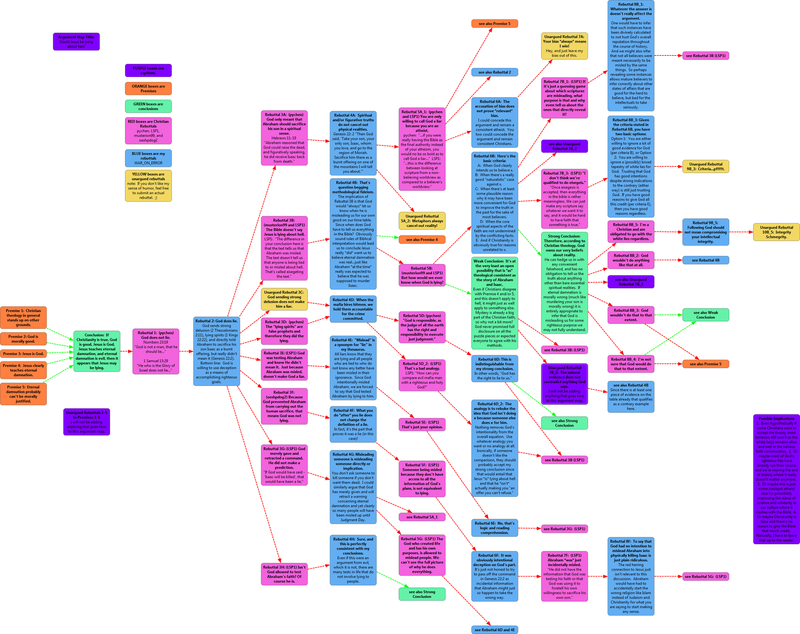 Hopefully, argument mapping software will quickly evolve to handle large, complex maps like the one I am drawing for the KCA. I’m looking forward to seeing the map. Keep up the great work, Luke! I’m sure I speak for many when I say your efforts are always appreciated. Argumentative is decent, but very bare-bones for the sort of thing you’re proposing — and that I’m actually trying my hand at myself. I’ve started a map for the argument from evil, on pen and paper at the moment. Interesting to see how it plays out. I’ll see if I can’t get argunet to run. Wow, that’s an impressive (and ambitious) choice. But I have the advantage of unlimited space. Sounds like a “Hilbert’s Hotel” statement. Luke maybe you can start getting some debate experience and by the time your 30 you can debate Craig. You still will not be qaulified technically but you will have 2 things going for you. 1. Craig will be older and hopefully less sharp and 2. Your on the correct side of the argument. Also even now at 23 you actually tackle his arguments unlike most of his atheist debate opponents. I’m not suggesting you go all Loftus just yet but as long as your being ambitious……. Either there is a buttload of stuff I don’t know about the Kalam argument or you are taking a whole bunch of petty details way too seriously. Guess we’ll find out. It sounds like an interesting exercise regardless. I’m downloading that argunet now to see if I can use it for other arguments that seem too complicated for other people to follow. Argunet seems to work great for me. I think I may try to chart some normal discussions to get some practice. Thanks for the encouragement, but I don’t feel technically qualified yet to do live debates – with hardly anybody. Also, I should do Toastmasters for a while, first. I’m not a public speaker, but I’d like to be. How far do you think it takes you down the road for the justification of theism? Conversely, if those who disagree with the Kalam were to grant most of its points and premises for the sake of argument, how much justification does it give theism? Admittedly, I get pretty lost when the discussions start getting technical, (especially in the cosmology department)… I simply don’t have the expertise to really have any good way of telling who is making the more plausible argument. But even so, its abundantly clear that the Kalam is especially built upon highly speculative philosophy and speculative science. There really can be no high level of confidence in many of the cosmological “facts” that the Kalam is built upon, at present. The argument can then only be as strong as its weakest link. I ask this question, because from where I am standing, I observe a large gaping chasm between the level of belief that most theistic religions demand, and the amount of certainty one could claim to have from the Kalam. The more I read other religious philosophical arguments, the more I see that they can accomplish no more than the Kalam seems to… they can put up enough fight to keep their lines of argument from being entirely discounted, but can offer no compelling reason why they would be likely, or worthy of the belief that their religions generally demand from their members. Luke, it’s been a long time since I started reading you (not as thoroughly, but maybe even more enthusiastically than I read Scaruffi). I have found many useful information on your (many, many, many) websites and blogs, but there is ONE thing that rocks my world more than anything else. Do you still have the link to the Wikipedia entry about that monk who wrote a book on atheism that was found after his death? Thanks a lot from Spain. I like that, drj. Like I’ve said before, philosophical discourse at this level seems, to me, to be essentially this: “Given that the world and the universe are how I’d like them to be, my beliefs are plausible.” At best, arguments like Kalam seem (again, to me) to allow for continued belief. I don’t see anything in them that would induce belief in me. To illustrate, it takes a lot less gas to maintain 60 than to get up to that speed. drj: Conversely, if those who disagree with the Kalam were to grant most of its points and premises for the sake of argument, how much justification does it give theism? Even if I granted that the Universe (as we now know it) had a beginning, there is no reason to believe that it had to be created by any sort of god. Even if it was created by some being who could be called God, that is no reason to believe that it resembled the all-knowing, all-powerful, all-benevolent God of philosphy. Even if that was so, the omni-God of philosophy bears no relation to Yahweh 2.0, the interventional God of Christianity. Thanks Luke! I made a pretty argument graph! Click on my name to see! K, we’ll try that link thing again. Click on my name to see it for sure, this time. Or here. His name is Jean Meslier. The first English translation of his famous work on atheism will be published this September. I will post about it at that time. Ben, wow that was quick! Nice job. A bit chaotic, though. Yes, those are great, aren’t they? Hey, I didn’t read any instructions. haha I’m slowing improving things though and am now on version 5. Any suggestions? Maybe put the conclusion that is being contested top and center and obviously apart from everything else, and then line up the primary objections below it on the right, and the primary supporting arguments below it on the left, and then let the counter-arguments to each descend from there? The way it is now, it took a while for me to even notice where the conclusion was, and the supporting and counter-arguments are all over the place. See, for example, this nice map. lukeprog: Dace,Yes, those are great, aren’t they? Fantastic, though they’re enormous. Thanks for the Bayes link, BTW. I’m reading through it now. Yeah, I was wondering if that would actually work out, but I’ll give it a try. Thanks. Please do post the results. I’m figuring this out as I go along, and your findings are useful to me. My friend Adrian and I like the maze feel where you never know where you’ll end up on version 5. All you gotta know really is that you are starting with the five yellow premises on the left. Hmmm. I think the problem might be that you point to the same response for so many different responses. Flowcharts are harder than I thought! True, but you know that’s the nature of debate, where people don’t realize how their later objections have already been addressed by previously brought up arguments and the debate just boots back up again. That’s frustrating, but necessary in some conversations. I think I may draw a little line out to the side that has a box that says, “see other box.” They are all lettered/numbered so that might work. This is the latest version. Version 7. It seems to be the most organized, though I have made some minor tweaks after I rendered it since the columns can be a bit more straightened in relation to each other. Hey, thanks! I spend so much time it seems keeping opponents on track that I really don’t feel like I’m wasting my time building maps of the arguments. Plus they are lots of fun to make! I actually printed this out at Kinko’s all nicely lamented for show and tell at the local atheist meetup group. It was neat. It’s been about a year since the last post. Are there any new developments in the world of argument mapping? I’d like to start this to help clarify my positions when I talk to those I used to go to church with. I run Linux, so I’m not interested in any Windows solutions. Not much new that I know of, BJ. There are several Linux apps listed above. Thanks for the reply. I’m playing around with Argunet, and I think it’s pretty neat. Glad to hear it! Let me know if you have anything to add to this page with what you’ve used. Btw, what do you think about using Prezi for argument mapping? Nah, that would be annoying as hell. The drawing functions are so limited in Prezi.